I wonder at times if my clients who place a shabby chic nursery at the top of their list of styles in nursery decor really know what they are asking for. I’ve decorated more than a few baby girls’ nurseries in this style and what I’ve come to realize is that everyone that has their own ideas of what shabby chic baby stuff actually is. A set pink and aqua blue shabby chic baby bedding set can be made modern through mix and matching fabrics. For example, an old-fashioned cabbage rose print fabric might be paired with a contemporary, geometric pattern. 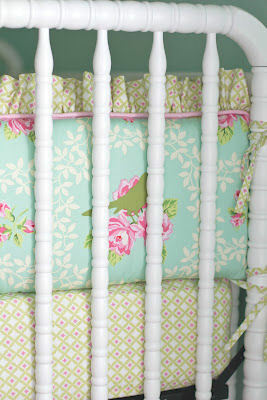 Bedding sets for baby girls that I've used in decorating a shabby chic nursery are primarily floral in design. In your search expect to see crib sets in a variety of fabrics with tiny springs of flowers, cabbage roses and the occasional hydrangea. I have also used damask and toile prints either well worn or in subdued colors with great success in a baby girl’s shabby chic nursery when a formal style of decor was preferred. But fancy fabrics are not a necessity; patchwork crib quilts paired with a crisp, white eyelet crib skirt have a beauty and elegance all their own. French or Parisian shabby chic nursery designs are by far the most popular but when decorating a room for boys, it may be necessary to resort to techniques with a less feminine feel. 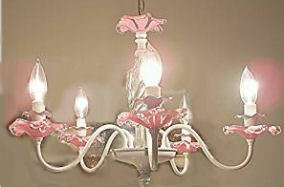 Finding the right light fixture is crucial and may involve hiring someone to update the wiring. 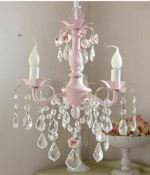 It's great for our shabby chic chandeliers to have an old look but the wires must be in perfect condition. Even with the cost of re-wiring you can save money by shopping for vintage ceiling lights at flea markets and garage sales. Empty picture frames picked up for a few cents can be spray painted and made fabulous! A well-worn welcome sign on the door to the nursery sets the stage. 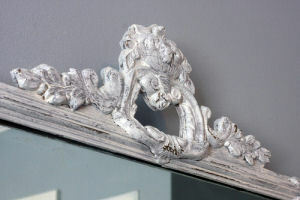 Small items add so much to the look of a shabby chic room. 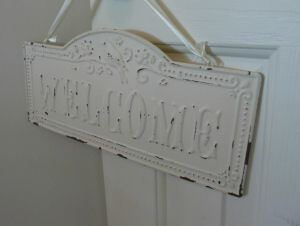 Vintage welcome signs, picture frames and other small decorations are as important as larger items. Consider repurposing an old hutch, bookcase or armoire for use in the baby's room. These pieces may have been relegated to the attic or barn because of the same flaws that now make them so attractive to decorators. Pick up inexpensive wooden frames at your local thrift or consignment store and create a gallery of photos in frames of all shapes and sizes. The more eclectic the mix of shapes, the better. Old picture frames are just one inexpensive way to decorate the walls of the room. 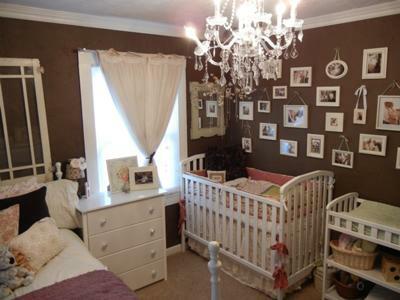 A white, painted mirror with a chipped frame gives an illusion of space in a small baby girl's nursery. For baby boys, an old patchwork quilt or crib bedding sewn from fabrics with a vintage print would be nice. The baby setting set for the last shabby chic nursery for a baby boy that I decorated was actually anything but a matched crib set. I managed to gather crib sheets and bedding that was an eclectic mix and match of prints and patterns in the same color family that looked as if it had been stored in a trunk in the attic for years rather than being the brand new items that it actually was. 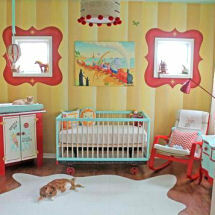 To some, a shabby chic and a vintage nursery theme are one and the same. While this may be somewhat accurate there is a real need to narrow the specifics of the design before trekking forth to the flea markets and vintage furniture stores to pick up bedding, furniture and room decorations. One person may believe that the key in successfully designing a baby’s room using this style of decor is to outfit the room using distressed baby furniture. Another may be entertaining the mental image of comfortable, overstuffed armchairs covered in slipcovers that appear to have through the laundry more times than a few. And still another believes that the linchpin of a shabby chic baby nursery is an array of chintz fabrics with a pattern of cabbage roses. My idea would be to employ a balanced combination using all of the above and THEN you will be on the right track especially when decorating a shabby chic nursery for a baby girl or boy. As I mentioned earlier in my shabby chic baby room decorating ideas, the lines between vintage nursery ideas and those called shabby chic can be so blurry as to be practically invisible. The suggestions above are merely tips to get you started. Perhaps the best advice that I can give to you is to suit your own decorative taste. If the baby bedding and nursery decorations look shabby to you that is all that counts. Return to find more Shabby Chic Baby Nursery Ideas and decorating tips for designing baby's first room in your own unique style. Do you have a great set of baby bedding or a picture of a nursery that you decorated with your shabby chic flea market finds? Share it!